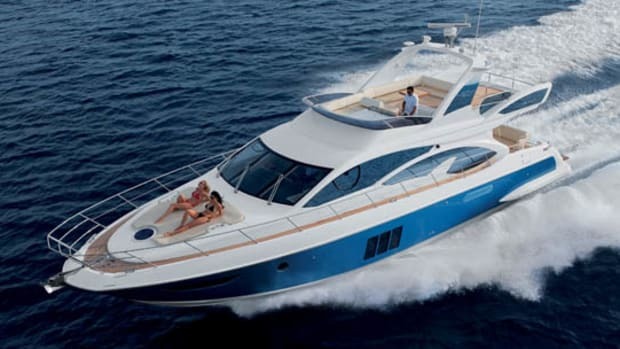 Power & Motoryacht's boat test of the Azimut 55S. 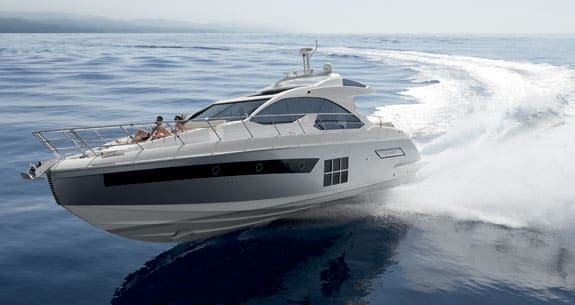 The Azimut 55S shows that forward-looking design can help prove the old saw that good things come in threes. 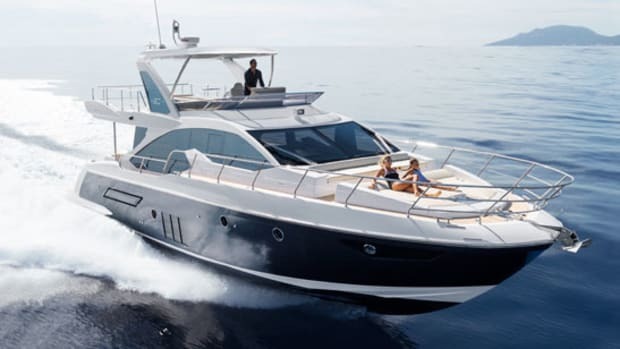 Azimut’s styling is unmistakable. And it is delivered with such confidence and panache, especially in the S-class range. Look at those angles, the bold, reflective window shapes, that steely “Miami Silver” hull paint. And the bow, snub-nosed in profile, an axe-blade edge—no one else would risk something like that. Even the detailing seems daring. The cool-looking carbon-and-steel grille on the stem, so cleverly reminiscent of a classic Alfa Romeo, is designed, apparently, to protect the boat’s gelcoat from the anchor. It’s such a stand-out feature though, that if it was my boat I’d probably be more worried about damaging the grille. Maintain Your Pods Change the oil in IPS pods when you do your bottom job every year, or if you exceed 400 hours. And be sure to read the owner’s manual for updated service tips. There is plenty going on behind the look-at-me exterior, though. 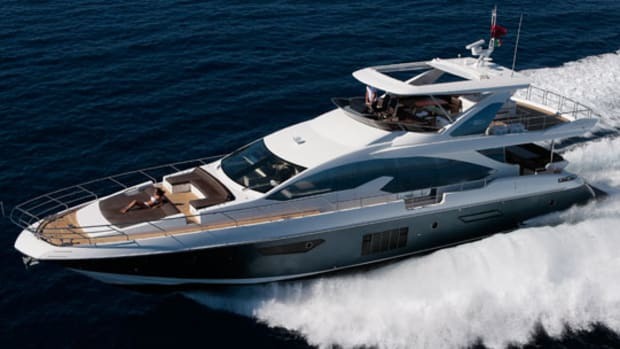 The 55S is about as high-tech as production yachts get, with a superstructure made almost entirely of carbon fiber. She has Volvo Penta’s IPS pod drives, and all the computer wizardry that goes with them. And she has three engines. Yep, three. This one fact tends to overshadow every other aspect of this beautifully appointed cruising yacht, with her zebrano veneers and lush leathers, immaculate finish and excellent interior design. Three engines—that’s all people want to talk about. Nevertheless, it’s still quite a surprise to lift the cockpit hatch for the first time and see them. Look at that: Three! There is also a generator down there, air-conditioning equipment, a hot-water heater, electrical and hydraulic systems, exhaust trunking, turbochargers, and all the other paraphernalia of a modern engine compartment, closely overlaid by the tray molding that supports the tender. Basic servicing components—water separators, oil filters, dipsticks—are near enough to the surface, and the primary fuel filters are mounted on the bulkhead in the usual way. However, to do anything major on any of the engines, and particularly the middle one, would be difficult without removing the soft patch overhead, a task usually best left to a boatyard. Just something to think about when you’re considering this boat. 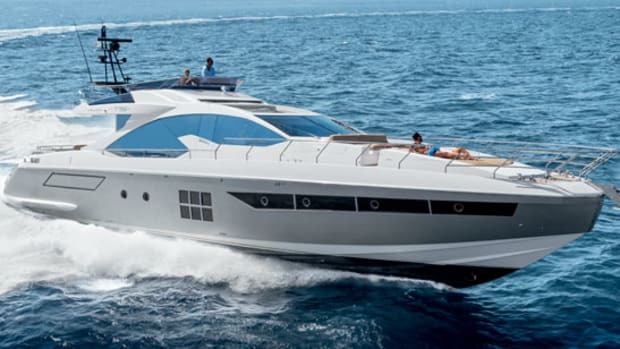 Azimut’s reasoning for this seemingly extravagant engineering package is simple. For a given power output, three IPS engines are lighter than two. Or more specifically, three 5.5-liter IPS600s weigh 5,958 pounds, compared with 7,936 pounds for two 10.84-liter IPS800s—although of course there is the extra drag of the third underwater unit to think about. As for fuel consumption, a glance at Volvo’s own figures suggests that three IPS600s are not really much better than two IPS800s, even when each IPS800 has almost twice the cylinder displacement. The real reason for the triple installation, though, has nothing to do with performance or efficiency. The remarkably compact IPS600s are a full three feet shorter than the bigger motors, and three feet of extra volume across the widest part of a 55-foot hull is not to be sneezed at. 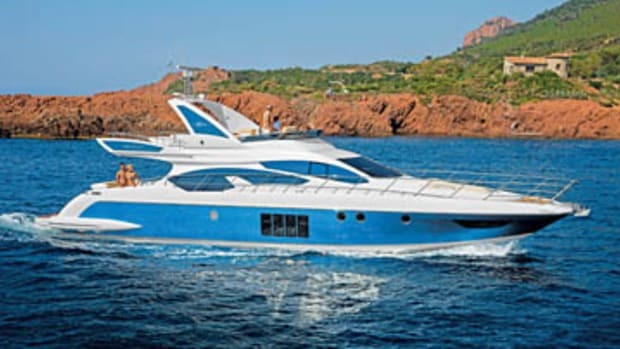 Azimut’s choice of IPS drives has made other choices inevitable. The engines have to be mounted right astern, so the crew cabin has to be up in the bow. This means, in turn, that the VIP cabin has to be set farther aft than usual, in a wider and roomier part of the hull. Luckily, the IPS600 motors are low as well as short, so there is room, just about, for a shallow tender garage over the top of them. 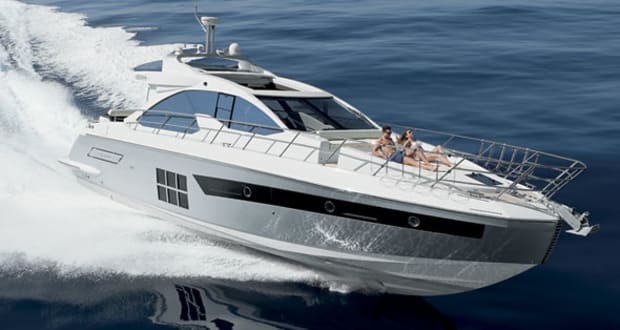 So you might go aboard the Azimut 55S expecting her to look bigger, at least down below, than the competition. The VIP, in particular, has something of the feel of an amidships suite, with substantial hull windows, a full-size bed, 6 feet 7 inches of headroom, and two useful hanging lockers. The head is not especially large, but access is good. Across on the starboard side, and sharing the dayhead with the VIP, the twin-berth guest cabin has just the single hanging locker and additional stowage under the mattresses. It is in the master cabin that the extra hull volume made available by the shorter engine compartment has really been put to work. It is an L-shaped suite, with a good-size head and shower compartment offset on the port side, which allows the sleeping area to span the full beam of the hull. A big berth (6 feet 5 inches by 5 feet 4 inches) is set on the diagonal, while there is an expanse of floor space and a genuinely useful two-seat dinette to port, by the window. What a great spot for a breakfast tête-à-tête. There is also plenty of stowage, including a large hanging locker and a vast space under the bed, which lifts up on gas struts. Headroom is a reasonable 6 feet 3 inches. 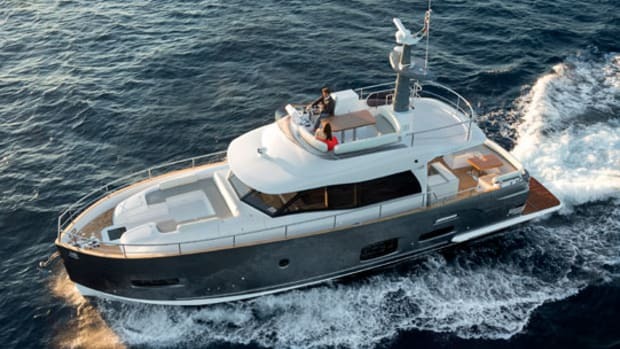 While the real benefit of the small engine compartment makes itself felt on the accommodations level, up on the main deck there are some smart design elements that also conspire to maximize the size of this 55. There is no step between cockpit and saloon, and the glass cockpit door is divided into four sections that slide away over to starboard. A drop-in seat can be positioned to cross the divide on the port side, joining up with the cockpit’s port-side seating and fostering a sense of continuity between the inside and outside. Meanwhile a huge sunroof in the hardtop opens up to the sky. Very cleverly, the side deck to port continues straight down to the aft steps, without invading the cockpit. 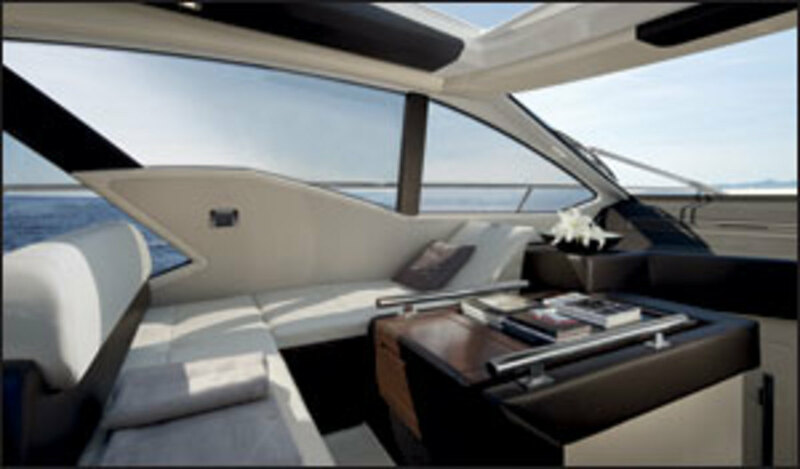 The convertible saloon sofa on the port side is a typical Azimut touch. The seat back slides fore and aft and also goes up and down, creating either a raised, forward-facing sofa for use underway, or a comfortable bench seat for the dining table. It’s both smart and space-saving. The galley is similarly deceptive, revealing itself from what looks like a sideboard along the starboard side, and seeming to disappear once the worktops are lowered again. Stowage appears in unexpected places, like the bespoke crockery drawer under the helm seat. With two separate seats and an adjustable wheel, the helm station is strictly business. Sightlines are excellent, and the Volvo Penta electronics package offers great control. The dash layout is busy but workable, and, in a forgivable outbreak of showboating, surmounted by the three tachometers. Look again: Three! However many engines you have, it generally takes at least 1,200-horsepower to make 20 tons of sports cruiser get up and go. The 55S’s 1,305-horsepower triple-IPS installation pushed her up onto plane from a standing start in less than 15 seconds, with peak velocity clocking in 20 seconds later. 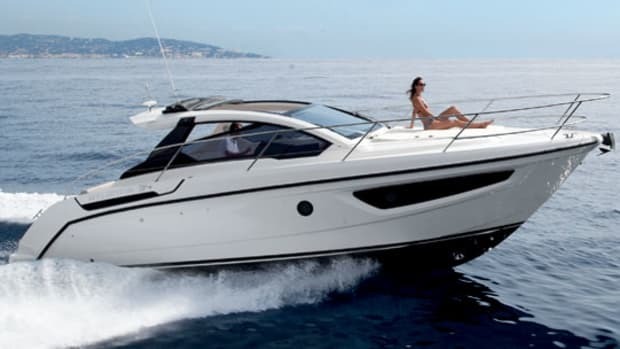 Azimut claims a 36-knot top speed for the 55S, which we didn’t manage on hull number one, but cruising speeds from around 22 to 30 knots are a comfortable and a practical prospect, which is more than adequate for most of us. Our test engines also seemed a bit thirstier at midrange settings than Volvo’s published fuel-consumption graph. This might just have been an instrumentation problem though, because at maximum revs the indicated consumption was bang on the curve. Interestingly, whether due to weight or space considerations, the 55S has a significantly smaller fuel capacity than many of her twin-engine competitors, which is reflected in our calculated range figures. 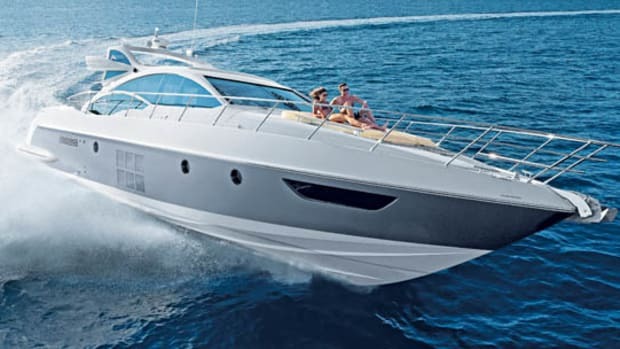 Underway the Azimut proved lively and responsive to the helm, and remarkably quiet in the saloon with the roof and doors closed, which will make for stress-free passagemaking. That clever sofa comes into its own underway, providing an extra forward-facing seat with great views all round. We had a typical Cannes boat-show load of ten people onboard, but everyone found somewhere comfortable to sit. It was a beautiful day. After a while, the consensus was that we should forget about going back, and just stay out in the bay for a bit. Life onboard seemed infinitely preferable to the realities on shore. And that, surely, is all you can ask of any boat. 260 gal. fuel, 78 gal. water, 10 persons, 600 lb. gear.